A few years ago, my friend Brooke moved to Nicaragua with her now husband, Jordan. Upon a visit back to the states, she brought me a bottle of Lizano salsa and our five-year (and ongoing) love affair began. The “salsa” is true salsa — a sauce. Not the salsa that first comes to mind when you hear the word. It looks, smells — and tastes — a bit like A1 Steak Sauce to me. My favorite thing to put it on area potatoes, other veggies and especially when I make a breakfast tofu hash type of thing. 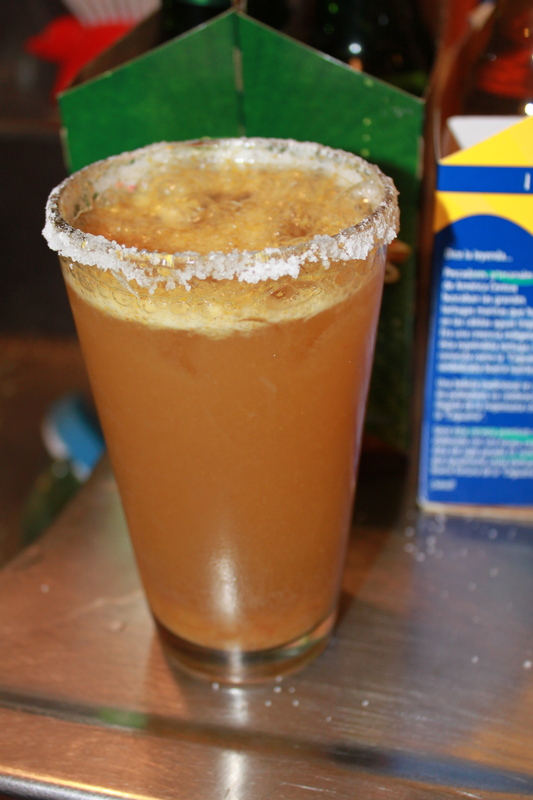 On our recent trip to visit B & J in Nicaragua, I was introduced to a whole new use for it: the Michelada. 2. 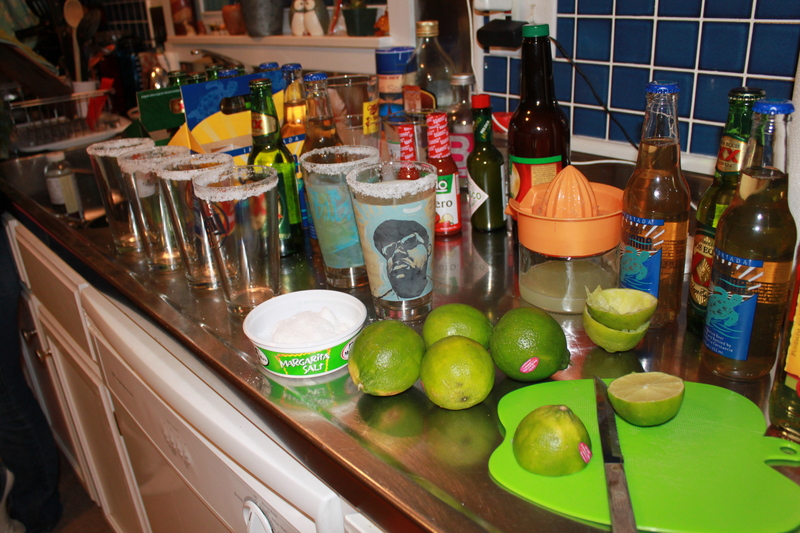 Load up your glass with ice and add the juice of 1-2 limes. 3. Add a dash or two of Lizano salsa. I add what probably amounts to about a teaspoon or two. 4. Add any other hot sauce you might want to spice it up a bit. Brooke says minced garlic can be pretty good in there, though Jordan disagrees. 5. Add beer. Since stores around here don’t carry the two beers of Nicaragua (Victoria and Toña), I grabbed Dos Equis and La Caguama, a Central American beer I never had heard of, but I figured, close enough! Since a whole 12-oz. beer doesn’t usually fit in the glass with all that other stuff in there, I take the rest of it and add after I’ve had about half of one. A lot of the spices, etc., have fallen to the bottom anyway, so it all balances out. When I first tasted a Nica Michelada, I thought I would never need to drink anything else ever again. They reminded me of a bloody mary or a red eye, in a really distant way, but were totally refreshing when sitting in 90-degree temps in Central America. Totally unique and flavorful, I’m glad I’ve added this to my cocktail repertoire, but really can only handle one at a time. 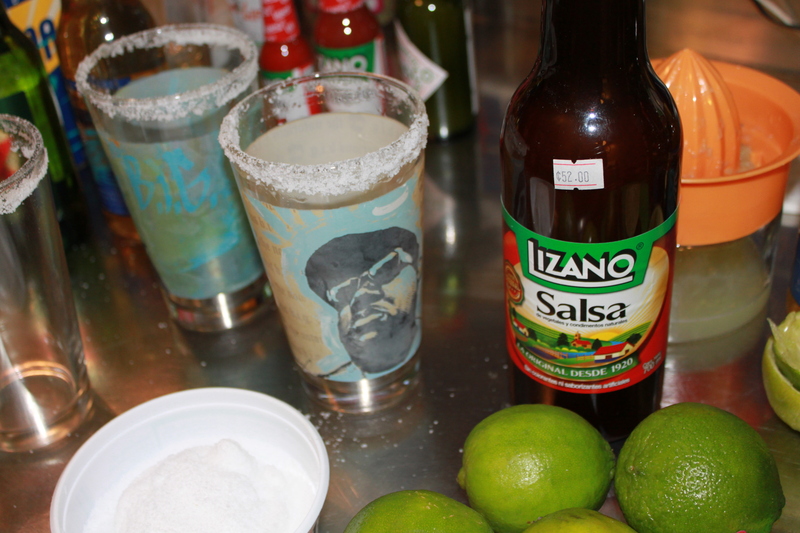 The salted rim + the salty Lizano salsa means by the end of the pint you’ve long surpassed your daily sodium quota. Entry filed under: cooking club, Drinks, Travel.